Seven North County teens cross the Catalina channel on Friday night to raise money for nonprofit Fresh Start Surgical Gifts. Pictured: First row (from left): Heloise Leblanc, Mia Ryan, Mia Thomas. Second row (from left): Tegan Preston, Lindsay Turner, Erin Taggart, Anna Brooker. 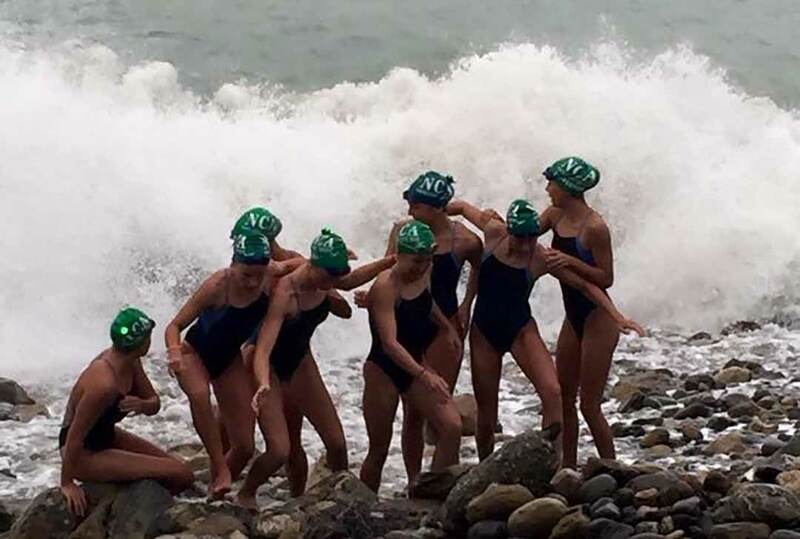 REGION — On Friday night, a new moon made it difficult to see the shoreline from Catalina, but that didn’t stop 14-year-old Mia Thomas from jumping in the Pacific Ocean and participating in a 21-mile relay swim to the mainland with her six other teammates. “We had no moon that night which was pretty interesting, but it was a clear night so we could see the lights on the shoreline from the start,” Thomas said. She is the team captain of the Ocean’s Seven, a group made up of seven North County girls from ages 14 to 15 who train at North Coast Aquatics. 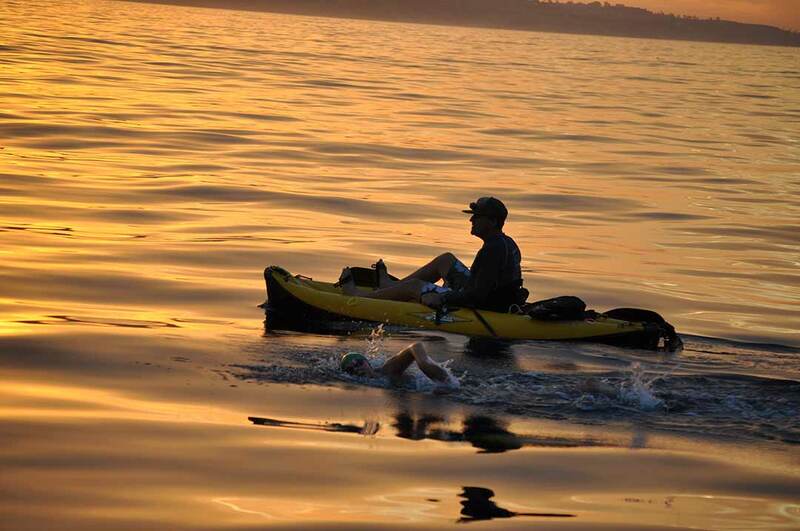 They completed a relay swim from Catalina to Rancho Palos Verdes in seven hours and 51 minutes, which was just under their goal of swimming it in eight hours. The team became the second fastest female relay team to complete the Catalina channel. The Lakewood Aquatic Club completed the fastest all women-relay in seven hours and four minutes in 1995. The teens took turns swimming for an hour until another swimmer would jump into the water from a support boat, which was equipped with technology that could track “bigger creatures,” according to Thomas. Their swim coach Rob Mackle, Mia’s mom Michella Thomas, Pam Brooker and Jeremy Preston guided the swimmers in a kayak. They each wore a light and followed the swimmers on their side so they didn’t have to crane their necks to look up. 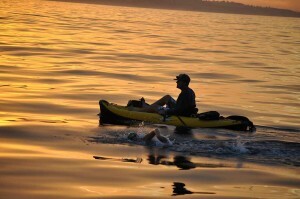 The conditions were ideal for the majority of the swim, until the end when Thomas said they faced some winds and current. The Catalina Swimming Foundation sanctioned the swim. The girls were not allowed to wear wetsuits nor have contact with their support kayak. The only contact they could have was to tag their teammate when it was time to switch positions. Thomas said the water temperature was great and her nerves quickly subdued after being in the water for a bit. “It was a little frightening getting in the water at first, just because it was new waters I had never swam in before, but once I got used to it, it went well,” said Mia. She kicked the race of at 11:10 p.m. in Catalina and the girls watched the sun come up on the mainland the following morning. “It was a good crossing and the girls worked really hard,” said Mat Leblanc, whose daughter, Heloise, swam in the relay. The other team members include, Mia Ryan, Tegan Preston, Lindsay Turner, Erin Taggart and Anna Brooker. Team Captain Thomas said there weren’t many obstacles although everyone got stung by jellyfish. The girls raised $15,000 for the nonprofit Fresh Start Surgical Gifts, which provides free surgery to disadvantaged children with deformities. Swimmer Mia Ryan said they were moved after looking at before and after pictures of the children who receive the surgeries. “(Fresh Start) helps with surgeries and making the kids feel better about themselves,” Ryan said.